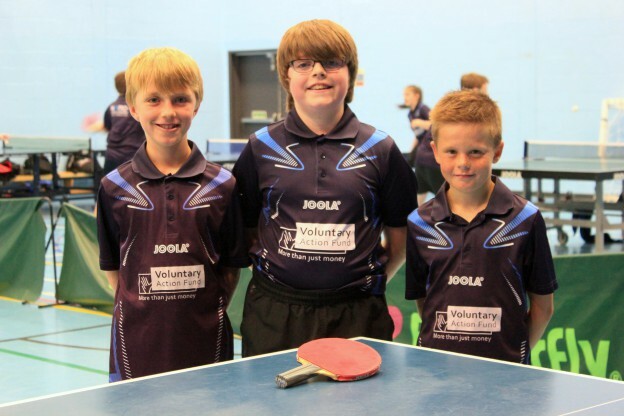 Patric Hollywood, Jamie Johnson & Chad Duncan are currently involved in Table Tennis Scotland’s Development Squad where they get the chance to train with 20 of the most promising under 13 players in our country. This entitles them to 15 weekends of top quality training throughout the season from Chinese born, Scottish national coach Li Chao. Chad, Patric & Jamie all reached latter stages of u11’s events last year, with Chad reaching the semi finals of Wongs Youth Open, Patric reaching semi finals of u11’s at North Ayrshire Open and Jamie winning South of Scotland Open u11’s event a couple of weeks ago. All boys currently train 4 nights per week which includes 1-1 slots with club coaches. The boys compete in national ranking competitions and West of Scotland Junior League. Picture from Left to Right – Patric Hollywood, Jamie Johnson & Chad Duncan.